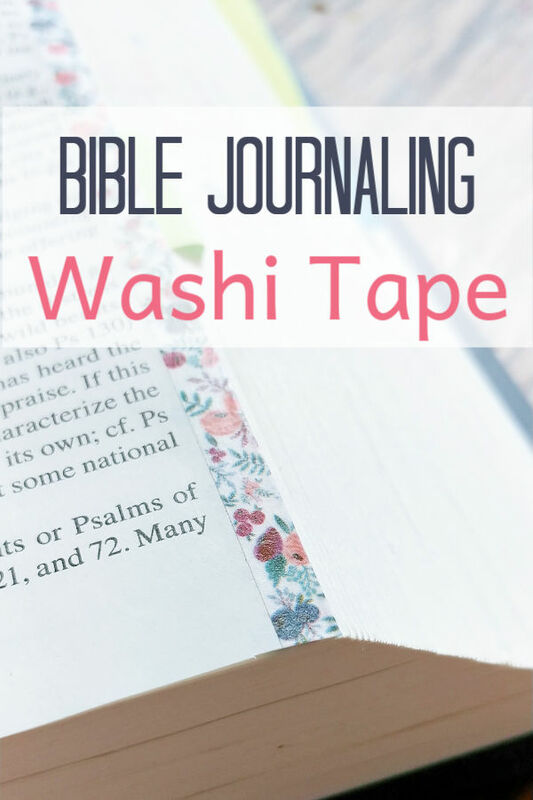 Let’s talk about one of my favorite Catholic Journaling Bible products, washi tape! I love washi tape because it’s quick and easy to use, can be found anywhere, and is inexpensive. If you’re new to Bible journaling, I have an older post encouraging newbies to just jump right in and get started. It’s called Bible Journaling Tips for the Hesitant. But let me tell you, that post isn’t just for newbies. I’m a few years into Bible journaling and I still get a little nervous sometimes when I’m about to start journaling in my Bible. I find I get a little more nervous and hesitant especially after I’ve been scrolling Instagram or Pinterest too much. I easily fall into the comparison trap and suddenly hate every attempt at Catholic Bible journaling I make. It’s only after the fact that I can recognize that as a temptation from the enemy to keep me from spending time in the Word and with God. But back to my favorite Catholic Journaling Bible product. If you told me you could only buy one product to get started journaling in your Bible, I would hands down, every single time tell you to buy washi tape. It is, and please forgive this hilarious comparison, it is the duct tape of Bible journaling products! Below I’m going to list all the ways I’ve found to use washi tape in my Catholic Journaling Bible. 1. Marking favorite books, chapters, and verses of the Bible. Using washi tape this way is similar to using bookmarks or tabs, only much prettier! The idea of using washi tape to mark favorite passages is similar in the idea as this post on Bible Journaling: Favorite Tabs. There are two main differences though. With washi tape, you cannot write a keyword identifying the verse. The other difference is the tabs are stiffer while the washi tape is more flexible. 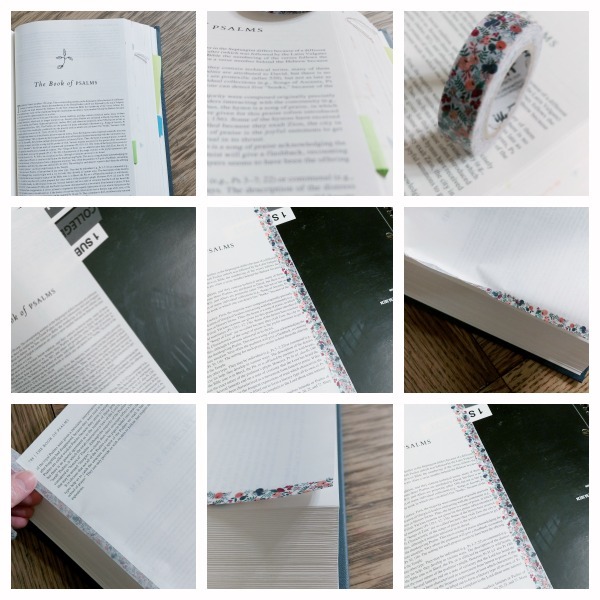 There are a couple of ways you can use washi tape to separate the Books of the Bible. One is to place a small piece at the beginning of each book. Another way is to tape the entire edge of each book. I tried doing this with my One Year Bible and I hated the results. After a while to front part of the Bible where all the washi tape edges were started flaring out. This is one of my favorite ways to use washi tape in my Bible, especially in Bibles that don’t have margin space for journaling. Not everyone wants a new journaling Bible or can afford a new journaling Bible and this is the perfect solution! It keeps those random slips of paper, holy cards, and anything else you stick in your Catholic Journaling Bible. It’s also a great way to add the bulletin or pages of notes you’ve taken in a Bible study. Oh and one more neat thing you can do. If you’re praying a certain verse for someone, you can washi tape their picture on the page by the verse! This is pretty, decorative, and a great way to use up random bits and pieces of washi tape you may have left over. Here’s a picture tutorial from Illustrated Faith on using washi tape as a “canvas” for journaling, especially with alpha stickers. This blog has some really cute and creative ways to use washi tape in a Bible. I love the first tip, the washi tape banner.